The CEO of a leading bank recently caused a flutter in the banking community by demanding the abolition of the Cash Reserve Ratio (CRR). RBI has promptly appointed a committee to look at this issue. The reserve ratios, CRR and SLR (Statutory Liquidity Reserve), are an important feature of Indian banking regulation. Alongside the debate about CRR, and new thinking about how monetary policy should be conducted, we should also review the SLR. SLR is a much bigger burden on the banking system and has no role in monetary policy. SLR reduces the resources available for commercial lending by banks. Every rupee deployed in SLR is a rupee not invested in a private enterprise that needs capital. There is no free lunch: when capital given to the government, it comes at the cost of capital available to the private sector. Any reduction in the SLR (as in the CRR) will yield more capital for the Indian private sector. It is hence important to critically analyse both. By creating a large captive source of deficit financing, SLR effectively subsidises government at the cost of savers and commercial borrowers. When a government has to borrow at a competitive rate in the market, the market exerts a check on irresponsible fiscal behavior of the government. When there is a large captive source of borrowing, the government is shielded from the pressures of the bond market and is more likely to engage in fiscal imprudence. Such a large scale preemption of savings by the government through SLR fundamentally distorts the interest rate structure in the economy by artificially depressing the yield curve. This complicates the pricing of all assets in the economy. What is the rationale for imposing SLR? What is the right level of SLR, that is consistent with this rationale and does not result in preemption of resources from the banking system? Are there other conditions that need to be imposed on SLR so that it achieves the objectives? What is the conceptual foundation for the regulator to impose SLR? The answer is: prudence. Banks raise public deposits with a promise to redeem them at par or more. To reduce the risk of the portfolio of the bank, the regulator ensures through SLR that at least some part is deployed in the safest assets available. But if prudence is the reason, what is the right level of such reserves that will ensure adequate prudence? Could it be that imposing a requirement as high as 24% is beyond prudence, and is actually a means for the government to preempt savings in the economy? It is hence important to ask the next question: What SLR do we need? What is the right level of the SLR? Banks are in the business of taking risk. These risks are taken by deploying public deposits. The most potent weapon that the regulators have used against excessive risk taking is "risk capital" which the equity capital committed by the banks owners. In fact, the entire edifice of modern day bank regulation is based on provision of risk capital as a buffer against risk taking by banks. If we believe, as do most regulators, in risk capital as the buffer against risks, then it makes eminent sense for banks to hold this capital safely. This would logically lead us to conclude that prudence should demand that the bank's risk capital be held in very safe assets. In India, the risk capital requirement is 9% of risk assets which translates roughly to 6.5% of NDTL (given that the risk assets are typically 70% of NDTL). Therefore, the policy prescription should be: Banks must hold their entire risk capital in safe assets which should include both CRR and SLR. Even if we assume the CRR is zero, this means that the theoretically right level of SLR would be around 6.5% of NDTL. If we scan the international landscape, this is the sort of number that we see in most countries. It is reasonable to argue that an SLR value above 6.5% of NDTL is motivated by pre-emption and not prudence. When the regulator prescribes a level of 24% for SLR, 6.5 percentage points are for prudence and the remaining 17.5 percentage points is really preemption by the government. The next important question about SLR is about its composition - what investments should qualify as SLR investments? Currently securities issued by the sovereign (Central and State Government bonds) are the only ones that are allowed as SLR investments. But if we accept prudence as the logic for SLR, then the regulation must make sure that these investments are as safe as they can be. This raises concerns about the rating threshold and of concentration risk. If Indian government securities are rated BBB and that of New Zealand government are AAA, it makes sense for banks to hold SLR in New Zealand Govt securities. Also, there should be limits on any individual issuer of securities, reflecting the standard risk management practice followed by any portfolio manager. The level of SLR should be consistent with the objective of prudence and anything over such a prudential level should be considered as preemption, which should be gradually eliminated. What does this mean? Let us assume that L1 is pegged at the currently prescribed level of 24%. We then define another limit, L2, which is closer to the prudential requirement of 6.5%. For simplicity, let us assume that L2 is set at 10%. This policy would demand that all banks maintain SLR at 24% but could go down this level upto 10% if and only if they enter into a repurchase agreement (repo) with another bank. Such a policy will mean that the banking system as a whole will continue to hold 24% SLR and so the government will continue to have access to this captive source of funding deficit. However, individual banks would be able to go down to lower levels if they have commercially viable opportunities to do so. Without diluting the overall investment by the banking system in government securities, it would provide significant flexibility to individual banks on commercial lending. In this respect, it is analogous to the idea of tradeable certificates for priority sector lending. While many researchers have started studying corruption, as of yet, the field is remarkably bereft of tangible policy choices that would yield reduced corruption. As I read The other side of reforms by A. K. Bhattacharya in the Business Standard, and Obtaining financial records in China by David Barboza in the New York Times (which describes the modus operandi of the New York Times' remarkable expose of corruption in China at the level of the Prime Minister, also by David Barboza), I thought there is one tangible policy lever through which we can combat corruption: Increase the transparency of companies and increase the transparency of politicians. It is useful to think at two levels: Transparency about the activities of companies created by politicians, and transparency about the activities of the big companies that pay bribes. I am reminded of the Extractive Industries Transparency Initiative. One element of this is an attempt to change the behaviour of repressive regimes (e.g. Russia) by forcing the companies that deal with them (e.g. BP) to behave differently. Even if the politicians are irredeemably bad, we can change things by modifying the incentives of the firms that pay bribes. In a recent post, Indian capitalism is not doomed, I argued that the markets for labour and capital are exerting pressure on firms, pushing them towards higher ethical standards even under conditions of medium grade enforcement by the State. To the extent that the firms are more transparent, their misdeeds are more likely to be exposed, and then these kinds of pressures will work more effectively. At present, the P&L statement of "public" companies is publicly visible in MCA-21. This definition needs to be widened so that the P&L statement for many more companies become publicly visible. The disclosure environment for listed companies in India is quite good. There is no quarterly balance sheet; the shareholding pattern statement is misleading; there are a few other blemishes. But the information access for listed companies is vastly greater when compared with what's in MCA-21. Many features of the disclosure regime for listed companies (where the work is led by SEBI) need to go into the disclosure regime for all companies (were the work is done by the Department of Company Affairs). If private limited companies become more transparent, politicians will try to use trusts and limited liability partnerships for their activities. Improvements in transparency should extend to LLPs, trusts and partnership companies also. Alongside a push for greater transparency by firms (both the big listed companies and the firms created by politicians), we should be pushing towards greater transparency by politicians. This push towards transparency has begun, and has started yielding some results. It needs to be carried forward. The comprehensive financial lives of MPs, MLAs, and their next of kin should be in the public domain. The transparency regime should kick in when a person wins an election, and should stay in place for atleast 10 years from that starting date. Any company or LLP with shareholding of more than 1% by an MP or an MLA or their next of kin should have to comply with the comprehensive disclosure manual of SEBI for listed companies. Any trust when an MP or an MLA or their next-of-kin is a trustee should have to similarly fall into a high quality disclosure framework. There is a tradeoff between privacy of citizens and corruption control. There is value in protecting the privacy of the business dealings of individuals. Perhaps, at the early stages in the formation of the Republic, where we're grappling with basics of governance, there is a case for violating the privacy of individuals in the quest for improved cleanliness in public life. Over the years, as the State falls into place, a greater push for privacy would be desirable. A. K. Bhattacharya in the Business Standard on how the UPA is faring well without Pranab Mukherjee. As we ponder the fundamental challenges that India faces, it is interesting to read Boss Rail by Evan Osnos in New Yorker magazine. India's new approach lets individual states take the lead on development by Simon Denyer in the Washington Post. Madhavi Goradia Divan in the Indian Express on defamation law. Towards better financial regulation and What is regulation for, by Ila Patnaik, on the big picture of the FSLRC approach paper. One head is better than many by Ila Patnaik. Let's not repeat the mistake of the RBI Amendment Act of 2006, she says. In the mood for reform by Ila Patnaik in the Indian Express, on the fresh push by the UPA government. The Evolution of India's UID Program: Lessons Learned and Implications for Other Developing Countries by Frances Zelazny. Great post-mortems of the Sahara case: Tony Munroe and Devidutta Tripathy on Reuters, and Tamal Bandhyopadhyay in Mint. These stories helped form my arguments in the recent blog post Indian capitalism is not doomed. Most of us take a certain degree of Internet access in India for granted. But not so long ago, getting to the net in India was nightmarishly hard. A story on FirstPost tells us about the early days, with an appropriate accent on Ernet, the pioneer which made all this possible. Don't bring your cell phone to meetings in China, you might get hacked by James McGregor on Quartz. The difference between reality and fiction is that reality doesn't have to be plausible. I was quite gloomy about what might happen with Iran's nuclear program, but for the second time in history, it is starting to look like sanctions might work. Quants aren't really like regular people by Izabella Kaminska in the Financial Times. Charles Duhigg and Steve Lohr tell us, in the New York Times that In the smartphone industry alone, according to a Stanford University analysis, as much as $20 billion was spent on patent litigation and patent purchases in the last two years - an amount equal to eight Mars rover missions. Last year, for the first time, spending by Apple and Google on patent lawsuits and unusually big-dollar patent purchases exceeded spending on research and development of new products, according to public filings. Two great stories about Barack Obama in Vanity Fair: The Hunt for `Geronimo' by Mark Bowden, and Obama's way by Michael Lewis. While on this subject, see Time magazine on Robert Gates. These three articles give us a sense of the gap that we face between governance in India today and that seen in a sophisticated country. David Quammen has a great story about zoonoses. In it, I learned that we now know that one animal reservoir of Marburg is the Egyptian fruit bat. Nineteen seventy three, a story by Alan Bellows that takes us back to how the world looked in the early 1970s. Offtopic: Here is a fabulous example (best viewed on a 30" monitor) of Google Art Project. The graph above shows headline inflation in India, i.e. year-on-year CPI-IW inflation. The informal target zone for policy makers in India is to have year-on-year CPI-IW inflation between four and five per cent. This is shown on the graph as blue dashed lines. From February 2006 onwards, inflation breached the upper bound of five per cent. It has never come back below five per cent. The red line shows the overall average inflation from 1999 to today: it is well beyond the upper bound of five per cent. If our informal goal was to get inflation between four and five per cent, we have failed to do this as measured by average inflation from 1999 onwards (averaging across both good periods and bad). Our loss of price stability is a major weakness of macroeconomic policy. It has far reaching consequences and hampers the extent to which the economy is able to get back onto a stable growth trajectory. The target -- year on year CPI-IW inflation -- is the moving average of the latest 12 values of month-on-month inflation. If we hope to get y-o-y CPI-IW inflation below 5 per cent sometime in the coming six months, then the latest six months should contain good news. 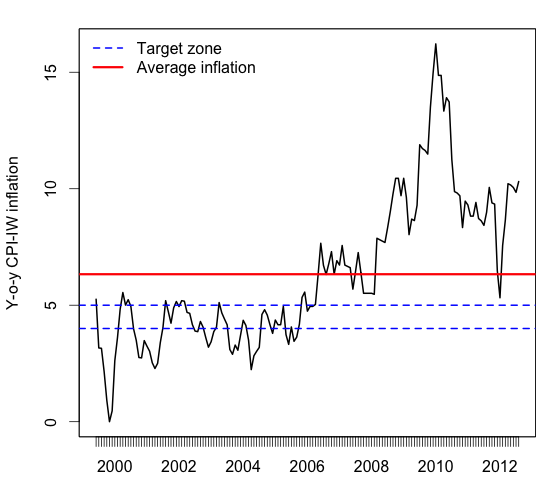 But there isn't a single month of data in 2012 where the month-on-month CPI-IW inflation was within the target zone of four to five per cent. It is, hence, likely that we're atleast a year away (if not more) for y-o-y CPI-IW inflation to drop below 5 per cent. Inflationary expectations are in excess of 10 per cent; the policy rate expressed in real terms is negative. Under these conditions, I fail to see how many people are thinking it's time for RBI to cut rates. As India becomes a middle income economy, and experiences business cycle fluctuations, we're going to require a quantum leap in the institutional and human foundations of macroeconomic stabilisation. One key component of this is an institutional commitment at RBI to deliver low and stable inflation. Some argue that private sector confidence, and stock prices, will be boosted by a rate cut. Will it? Will the private sector be impressed by a display of low institutional capacity? Will lower rates foster investment? I'm curious to see how this will work out. As we see, in the overall dataset, 31.31 per cent of the working population is in agriculture. CMIE shows three categories of this -- `Small farmer', `Organised farmer' and `Agricultural labourer'. I have added up these three categories to make the table above. That 31.31 per cent of the Indian workforce is in agriculture is fairly well known. What I had not thought about, previously, is the age structure. Will agriculture have a bigger share of young or old workers? We can envisage two competing effects. On one hand, if a family has underemployed young ones who are engaged in agriculture by default, then we'd see a lot of young people in agriculture. On the other hand, if families try hard to get their kids off the farm, and the growth in industry and services in India is successfully absorbing this workforce, then we should see a smaller share with the young. The evidence above favours the latter story. The share of the overall workforce which is engaged in agriculture is 31.31%. But amongst the old (age 55-60), the share is higher at 40.02%. This share steadily drops as you get to the young. In the class of the working young (i.e. age 15-20 but a part of the working population), just 19.69% are in agriculture. Perhaps there is greater malleability of human capital with the young: the old may not be able to easily pick up the skills required to participate in the modern world of services and industry. When the shift of a worker into services or industry is accompanied by migration, it adds up to a powerful engine of social and economic modernisation. It is a powerful mega-trend that is reshaping India today. The agricultural workforce is greying. There are many divides between the old India and the new one. This evidence suggests one more: the old world of agriculture is disproportionately one of the old, while the new worlds of industry and services are disproportionately manned by the young. This data helps us understand India's demographic dividend. Many people worry that services and manufacturing in India will not absorb the great surge of young people in India. If that was the case, there would be a lot more people in agriculture. Instead, we see only 20% of the young depending on agriculture. The application of sound economic principles in the field of agriculture will give us a situation where no more than 5% of the workforce is required there. At present, agriculture is using up 31% of the workforce. This gives us a headroom of an additional 25% of the workforce which can move out. This movement would give a one-time improvement in GDP because the per-worker output in industry or services is greater than that seen in agriculture. But these effects are diminished with the young, where the alteration that's feasible is smaller: from 20% to 5%. For an interesting comparison against China, in 2007, roughly 10% of the workforce was in agriculture in the age group from 16 till 35. By the time you got to the age group of 41-50 (in 2007), roughly 45% were in agriculture. By 2012, China has reached a point where there is relatively little upside for GDP growth by getting workers out of agriculture. The Indian evidence for 2012 looks similar to China of 2004, so India is perhaps 10 years away from this loss of upside in GDP growth. My previous blog post, on not cancelling trades after a fat finger trade, elicited some interesting email conversations. In a nutshell, there are two views of the world. One camp argues that it is important to prevent fat finger trades and other such weird episodes. This requires building an array of preventive measures. The other side argues that the costs of prevention are high, and what's really important is to make a resilient market that is able to absorb shocks. NSE and BSE are some of the biggest exchanges of the world. We should be pleased that India has two of the great factories of the world doing order matching. But as a side effect, NSE and BSE are at the limits of what today's CPUs can do. Many, many orders are placed, compared with the number of trades. Pre-trade checks are expensive because the number of orders is high. Fairly trivial notions of pre-trade checks can triple the hardware requirements or worse. We have to ask ourselves: Is it worth driving up the cost of transacting by 3x or 5x or 10x in order to do those checks? In addition, pre-trade checks introduce delays ("latency") which are not good for the trading process. When an order is placed, the person wants an instant confirmation that it was placed into the order book and ideally matched. More work in screening orders before the trade increases the latency suffered by traders. This, in turn, increases the risk faced by various trading strategies, which has adverse implications for market liquidity and market efficiency. What validation rules would you write, pre-trade? There is a danger of fighting the last war. New kinds of problems will inevitably surface in the future. Will we keep on increasing the burden of pre-trade computation, over the years, as the list of potential difficulties goes up through time? There is a shades-of-gray dimension here. It appears obvious to us that if a computer program is buggy, and puts in a wrong order, this should be blocked. But what when a man-machine hybrid (the typical human trader that operates a computer) makes a mistake? What about a pure human trader that makes a mistake (e.g. saying on the phone "buy me 25 million shares of Infosys" when he meant "buy me 25 million rupees of Infosys")? Where do you draw the line? It is better, instead, to see that mistakes are an inevitable part of financial markets. I would argue that pre-trade computation should be kept to the bare minimum, and that it is instead important to focus on deeper initiatives that will make the market more resilient. We need more eyeballs, more capital, more limit orders, more arbitrageurs, more algorithmic trading, more short selling. This is what will make the market resilient. A resilient market is one that is ready to accept a diverse array of unpredictable shocks in the future. Until a few weeks ago, we never imagined an order for 17 lakh nifties could be placed. The market did well in absorbing this completely unanticipated shock. The market should be a flexible, intelligent, resilient construct that is ready for all sorts of unexpected events of the future. Some people say: "We should put in infinite expenses in order to screen orders". This reflects a lack of economic thinking. The strategies of prevention and cure need to be evaluated from a cost/benefit perspective. Each features tradeoffs. Driving up the charges of an exchange by 3x to 10x, and increasing the latency suffered by every market participant, is a big cost. This should be weighed against the benefits. I am reminded of a great story told by the Chilean economist Raimundo Soto at a NIPFP/DEA Conference in 2009. He started by describing a cautious 80-year old person, who is very careful about what he eats, who avoids stepping out of the house, and so on. He stays alive, but is perennially afraid that a small sickness will bring him down. And, indeed, when one small common cold comes along, it can have catastrophic consequences for him. Compare this with a 15-year old prancing around the world, tumbling in the dirt, taking risks, and living a great life. He is exposed to many illnesses, but rapidly bounces back from each of them. Raimundo Soto said that the analysis of capital account convertibility should be rooted in the desire to become this 15 year old rather than this 80 year old. We should be asking: How can the system be made more resilient to shocks? We should not aspire for a Chinese Wall of capital controls that cuts India off from the global financial system; instead we should be doing the things that make India resilient to international shocks - such as develop a sophisticated Bond-Currency-Derivatives Nexus. In similar fashion, too much of the conversation in India, after the Emkay fat finger trade, is about asking How can such shocks be prevented? I think we should aspire to be like the 15 year old and not like the 80 year old. The really important question is: How can the system be made more resilient to such shocks? Cancelling trades on an exchange: When is it a good idea? When inexplicable things happen on an exchange, many people argue that those trades should be cancelled. I think it is useful to be clear about the test to apply for this. The key question should be: Did something foul up in the order matching software? If order matching went wrong, or if there was a systematic breakdown of connectivity to the exchange, then there is a case for cancelling trades. We'd say that persons placed certain orders, but the exchange mis-handled the orders, hence the observed series of matched trades and prices is unfair. If the exchange and its rules worked as advertised, this reason peels away. In fact, I would argue that particularly when there is a fat finger trade or something like the US `flash crash', it is important to not cancel trades, to cement faith in the trading process. The recent events surrounding the fat finger trade by Emkay are a good example of this line of thought. Owing to a human error, a basket trade to sell Rs.17 lakh of Nifty was instead placed as an order to sell 17 lakh nifties (where one `nifty' is a basket of 50 shares adding up to the present level of the Nifty index expressed in rupees). If Nifty is at 5000, then an order for "100 nifties" is an order for Rs.500,000. Through this human error, a very large sell order appeared on the market. At that instant, everyone looking at the market would have been taken aback. What was going on? Has a huge event unfolded which some informed speculator knows about, but I do not know about? It takes nerve in that moment to be on the other side of the order. We must reward the people who did not lose their head when everyone around them was losing theirs. When the big Emkay order came in, many of the orders which were matched were limit orders which had been patiently waiting there. This does not, in any way, change the analysis. Waiting with `deep out of the money' limit orders is a hazardous business. As an example, consider the persons waiting with deep out of the money limit orders, standing ready to buy at very cheap prices (e.g. 10% below the current market price) when the Satyam scandal unfolded. They lost money big time because the informed speculators, who understood the Satyam announcement and placed massive market sell orders, knew more than them. Waiting patiently with limit buy orders, 10% away from the touch, is not free money. ("The touch" is finance parlance for the bid and the offer price). It is a risky trading strategy. Two trading strategies matter most in stabilising a market when crazy things have happened. Traders have to be there ahead of time, with limit buy orders far away from the touch. The limit order book should be thick with orders; i.e. the impact cost associated with a giant market order should be low. And there have to be traders who see that the market has crashed, are able to work the phone and gain confidence that this is an idiosyncratic shock, and come into the market and buy. The more the capital and intelligence behind such trading strategies, the more stable the market will be. If trades are now cancelled, these two trading strategies will have suffered the risk and got nothing in return. In the future, they will be more circumspect about stabilising the market. Similar considerations apply on the other side. When there are strange and large upward moves of the market, we want rational speculators who short sell and bring the price back to fundamentals. The market must be designed in a way that supports and enables this. At present, it is not [link, link]. Fat finger trades will happen. There will occasionally be strange rumours and other odd things that will make markets fluctuate away from fair price. In those situations, what we want most is for clear-headed rational speculators to put large scale capital into making money by stabilising the market. The rules of the market should reward the people who perform these roles. Trades from their orders should not be cancelled. The Emkay story has gone well for the Indian securities markets. The market design worked as it should have. A human error was made, there was a brief market-wide suspension on the equity spot market (but the futures market continued to work). A call auction took place to discover the price, and within minutes everything came back to normal. Emkay took full responsibility for their trades and came through with the money. We shouldn't stumble in the policy analysis that follows this story. Harsh Vardhan's excellent blog post on this subject made me think further about the questions. Finance policy makers in India are often proud of the fact that India has avoided a large systemic crisis in which substantial fiscal resources have been put into rescuing financial firms. I think this optimism is overstated. If we look back into the last 20 years, there has been a steady process of government money going into financial firms. On one hand, we have big events like UTI or IFCI or Indian Bank where large sums of public money were put into financial firms. Equally important is the regular flow of government money into PS Banks. India is in the midst of a business cycle slowdown. This has come after the biggest-ever credit boom in India's history: in 2007, year-on-year growth of non-food credit was nudging 35%. As we know well, a boom in credit is followed by a boom in NPAs when a downturn comes about. We may well be at the cusp of an upsurge of NPAs. In this case, the pressure on capital in PS banks is going to be acute. If government thoughtlessly continues on the path of putting public money into PS banks then it would involve large sums of money. As Harsh remarks, the striking feature of this annual resource flow is the way it has become commonplace. Nobody even notices this any more. In a time where government does not put equity capital into any other PSUs, the scale at which this is taking place is quite remarkable. When the government builds a highway, the cost-benefit analysis is straightforward. Do we want to spend Rs.5000 crore in order to get a 1000 kilometre highway? A tangible result -- the highway -- is the fruit of the fiscal labour. In contrast, capital infusions into PS banks are not animated by a clear goal. What are we doing? Why is this wise? What is the cost benefit analysis? Are there other mechanisms through which the same objectives can be obtained at a lower cost? As the approach paper of the FSLRC has emphasised, perhaps the most important element of the public policy process that we require in India is clarity on objectives, and a clear demonstration that the proposed policy initiative is the best way to achieve the objective. I would classify the annual fiscal transfers to PS banks as part of the larger problem, that the edifice of Indian financial economic policy has been grounded in inadequate analysis. I am almost certain that 1000 kilometres of highway is a better use of public money than putting it into the equity capital of a PSU. Once objectives are articulated, it becomes possible to measure the extent to which those objectives are being achieved. Evidence can be brought to bear about the extent to which the claimed objectives are being pursued. As an example, Shawn Cole did a beautiful paper which demonstrates the extent to which PS banks are a tool for rigging elections in India [journal link, ungated pdf]. If this is what PS banks do, are we better off if PS bank assets would decline, as a fraction of GDP? A key feature of a world where banks are required to have equity capital is that not all banks get this equity capital. Some banks do well, they build up their balance sheets, they have good prospects and are able to raise equity capital, and they are able to grow. Alongside them, weaker banks fail to grow. This is perfectly appropriate and a desirable feature of the system: a healthy banking system must be one where only some banks are able to grow. The fact that a bank with the average ROA requires capital for growth does not mean that we should be putting public money into all banks that require capital for growth. Many, many banks in India do not deserve to grow and hanging tough is the right way to deal with them. Growth is not a birthright: a bank must do well, and pass the market test, and thus earn the right to grow. There are many elements of banking policy which are driving down the return on assets. Easing these constraints is a better path for policy rather than putting in public money. Banks in India are facing a combination of swelling NPAs, and difficulties in finding capital to grow. It is not fair for private banks to face competition from PS banks that get equity capital for free. I am reminded of Kingfisher. As long as Kingfisher was around, with an artificially low cost of capital, this exerted downward pressure on air fares, and hurt all healthy airlines. The exit of Kingfisher was of essence in bringing the rest of the industry back to health. This is the story of Japan's `zombie firms': when failed firms were kept alive using public money for capital infusions, this infected healthy firms. Percy Mistry famously pointed out that Indian finance suffers from the presence of `zombie banks', who only walk the world on the life support of public money. This is a deeper consequence of easy access to capital for public sector companies that we in India should be worrying about. Harsh is undoubtedly right in suggesting that government should be willing to accept a reduced shareholding in PS banks while retaining control under the Bank Nationalisation Acts. But this leaves the residual question: if PS banks have a low ROA, the share price that this can support is low, if investors see no possibility of true privatisation in the years to come. The amount of equity capital which will come by going down this route is limited. The real story has got to be to ask PS banks to demonstrate that their claim on public money is backed by a good possibility of using capital better than NHAI. Suppose we suggest that the government should be stingy in giving equity capital to PS banks. In the short term, the partial equilibrium analysis suggests that this will hold back the growth of banks and thus the size of Indian banking. We should bring two different perspectives to this. First, the very absence of free capital for PS banks will increase the profitability and thus equity capital access for private and foreign banks. The overall impact for India will thus be attenuated. In addition, it's easy for government to have entry of 20 new private banks. Suppose each is asked to bring in Rs.500 crore as equity capital. Using the rough 20x leverage that's found in Indian banking, this gives us new bank assets of 2% of GDP or Rs.2 trillion.